2015 was a difficult year in the investing world. As it turns out, one of the best performing assets last year was cash since most other asset classes lost money. According to CNBC, 2015 was the hardest year to make money in 78 years. Investment legends struggled with David Einhorn's Greenlight Capital and Bill Ackman's Pershing Square fund both losing 20%, while average hedge fund performance did not breakeven. In the process, 31 hedge funds shut down during 2015. It is against this backdrop that we highlight our own struggle in 2015: +36% for our primary indicator (the VRP+VXX Bias). The end results were respectable, but getting there was anything but easy. The second half of the year was fairly stressful and a bit disappointing given that it was +77% in June. The 2015 equity curve for each of our indicators for trading XIV & VXX, along with XIV's performance, is shown in the following graph. Drawdowns were painful with VXX Bias experiencing a 43% drawdown in August, fully recovering and hitting a new peak of +94% YTD on September 1st, only to be followed by a 40% drawdown in October. VRP+VXX Bias strategy also experienced a 40% drawdown in the second half of the year and was not able to recapture its +77% high from June before year end. For the more experienced traders these drawdowns were rather unpleasant. For the uninitiated, the drawdowns were probably enough to make them call it quits. But in the end, it was another year of outperforming just about everything by a large margin with only a couple dozen trades. In order to compare our results to other known volatility strategies I've included Volatility Made Simple's 2015 performance graph for 24 strategies, below. Only the VIX vs VXV strategy outperformed our VRP+VXX Bias in 2015, but that strategy's long-term performance remains comparatively poor and suffers from inconsistency (57.6% avg annual return, 0.93 Sharpe ratio, and 70.6% max drawdown). 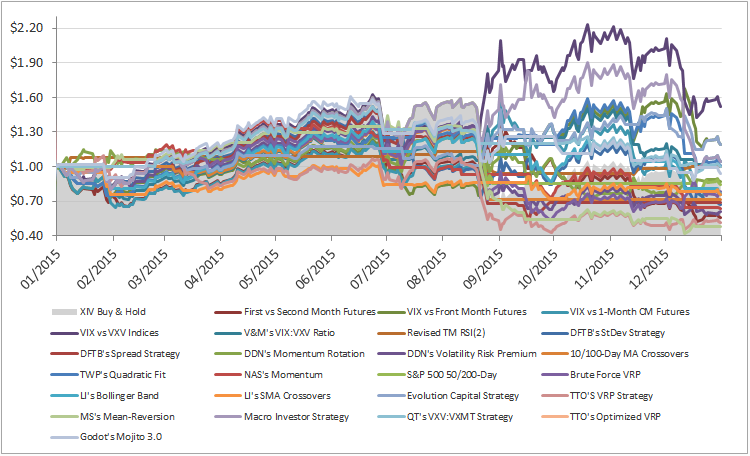 At -2%, ZIV (the medium-term VIX Futures inverse fund) once again outperformed XIV, which came in at -17% for 2015. While the ZIV Bias indicator was successful in its goal of keeping traders in cash and out of August's major drawdown, it faltered a bit during the choppy trading at the very beginning and end of the year. 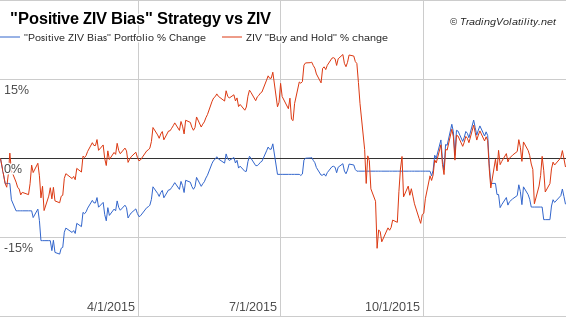 Ultimately, the ZIV Bias indicator underperformed buy-and-hold this year with a -9%. Trading Volatility+ subscribers have the benefit of seeing our intraday indicator data, receiving emails with preliminary and final change alerts for each of the indicators as well as our daily summaries, and interacting with our private community of volatility traders in the forum. If interested, you can learn more about our services on our Subscribe page. 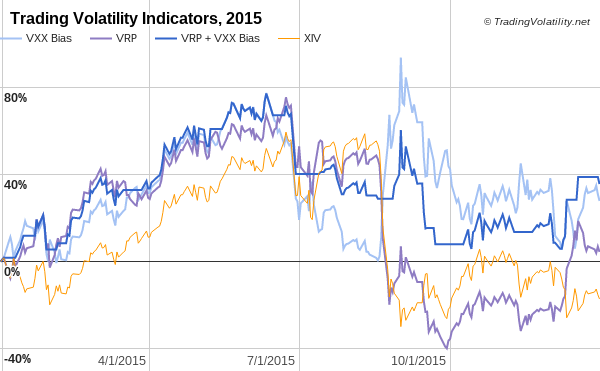 2016 is already shaping up to be another exciting year for Trading Volatility. We'd love to have you join us in taking on this difficult market!